Samsung Galaxy J7 (2017) is the latest iteration of the J7 series from its Korean maker. The mid-ranger, the regular variant of the slightly bigger Galaxy J7 Max, features a Full HD Super AMOLED display, an octa-core Exynos processor, and 3GB RAM. The Samsung Galaxy J7 (2017) parades a relatively slim metal body, coming in at 8 millimetres in thickness. It will be available in gold, pink, silver or black finish. The phone is a bit bulky at slightly over 180 grams. You get a 5.5-inch Super AMOLED display, a tad smaller than the 5.7-inch unit on the J7 Max. But this one promises better image quality when you consider the higher pixel density of roughly 401 ppi. The Samsung Galaxy J7 (2017) appears to offer similar cameras as its bigger sibling. On the rear you will find a 13 megapixel unit with an aperture size of f/1.7 and autofocus. This shoots Full HD videos at 30 frames per second. You get another 13 megapixel shooter with flash for selfies. Built-in storage stands at 16 GB, of which around 10 GB is available to you. The Samsung Galaxy J7 (2017) also supports up to 256GB microSD card. There is also an octa-core processor on the Samsung Galaxy J7 (2017) like the Max version. But Samsung opts for in-house Exynos 7870 chip with a Mali-T830 MP2 GPU here. The RAM has lower capacity of 3 GB of RAM, compared to the 4 GB its larger brother offers. Samsung Galaxy J7 (2017) boots Android 7.0 Nougat operating system promising rich user experience. The Secure Folder feature that is typically available only on flagship devices from Samsung is built into the Samsung Galaxy J7 (2017). This means that you can use two instances of similar social networking apps, such as WhatsApp, on the device. Juice supply is the duty of a 3,600mAh non-removable battery rated to offer talk time of up to 24 hours. There is also a fingerprint sensor for added layer of security. Samsung Galaxy J7 (2017) supports 4G LTE with download speeds of up to 300 Mbps. In Nigeria, the Samsung Galaxy J7 (2017) supports LTE on Glo Mobile, Etisalat, NTel, MTN, Smile, and InterC. Samsung Galaxy J7 (2017) is not officially available in Nigeria, Kenya, and Ghana. However, you may be able to buy the Android phone at leading online stores in the countries. 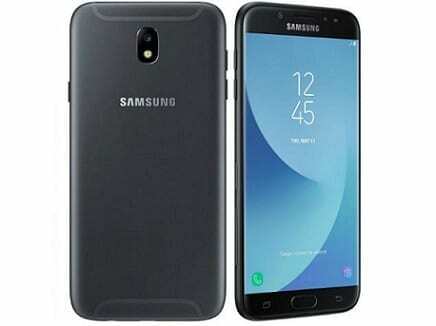 Samsung Galaxy J7 (2017) Price in Nigeria is expected to range from 80,000 Naira to 150,000 Naira depending on your location in the country. Its price in Ghana starts at around GH₵ 1,269. Samsung Galaxy J7 (2017) Price in Kenya starts at around 26,690 KSh.